For the first time, a treatment that boosts the immune system greatly improved survival in people newly diagnosed with the most common form of lung cancer, the AP reports. In the study, Merck's Keytruda, given with chemotherapy, cut in half the risk of dying or having the cancer worsen, compared to chemo alone after nearly one year. The results are expected to quickly set a new standard of care for about 70,000 patients each year in the United States whose lung cancer has already spread by the time it's found. 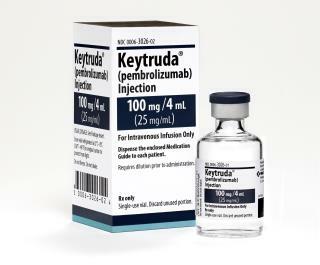 Keytruda was approved last year as an initial treatment with chemo for the most common form of advanced lung cancer, but doctors have been leery to use it because that was based on a small study that did not show whether it prolongs life. The new study, led by Dr. Leena Gandhi of NYU's Perlmutter Cancer Center, gives that proof. In it, 616 patients were given chemo and some also received Keytruda. Those not given Keytruda were allowed to switch to it if their cancer worsened. After one year, 69 percent of people originally assigned to Keytruda were alive versus 49 percent of the others—a result that experts called remarkable considering that the second group's survival was improved because half of them wound up switching. How much it ultimately will extend life isn't known—more than half in the Keytruda group are still alive; median survival was just over 11 months for the others. Have to pick up more info on this elsewhere. When they mentioned it on the news last night, they said this treatment wasn't for small cell lung cancer, the smoking-caused type of cancer. I didn't know that large cell cancer (non-smoking related) was more common than smoking related. That's news to me. this is wonderful news. i hope this saves many lives. The other good news is that the only side effect is the loss of your house to pay for it.